Scientists have devised a portable, noninvasive and direct approach to image infant brain activity in a clinical setting without relying on massive scanning machines, and they used the method to monitor seizures with higher resolution than what other technologies can currently achieve. Insight about infant brain activity from the new technology could potentially pave the way to therapeutic innovations for neurological disorders. The device consisted of a custom-designed combination video-electroencephalography (EEG) and ultrasound probe weighing only 40 grams (about as heavy as a golf ball), which Charlie Demene and colleagues used to map out subtle changes in blood flow inside small brain vessels correlated with electronic signals of neural activity. Measurements from the probe distinguished between quiet and active sleep (two well-defined mental states) in six healthy napping newborns. The researchers also applied their set up to monitor brain activity in two infants with drug-resistant seizure disorders, which enabled them to detect waves of neurovascular changes spreading throughout the babies’ cortexes and trace the brain regions where the seizures originated. 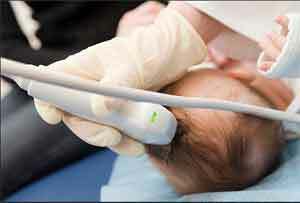 According to the authors, the new technique’s low-cost and ease-of-use might make it the standard choice for bedside brain imaging in neonates.